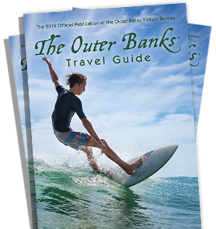 You may already know about the Outer Banks’ unbelievable collection of natural, cultural and historic gems courtesy of our National Park Service sites and State park attractions. But, the fabric of the community is also shared through its town and area parks. This is where we live. The nature trails and recreational areas found in the three maritime coastal forests of Kitty Hawk, Nags Head and Buxton. The picturesque Duck Boardwalk and Town Park Amphitheater bringing the community together for morning yoga, a concert or the unbeatable OBX sunset viewing. The young and young at heart can be found working on moves at the skate parks, while others dial in the backhand at tennis courts in Buxton, Wanchese and Kill Devil Hills. So if you’re looking for something a little off the beaten path but still very much Outer Banks, find the park that’s nearest you and your interests.